Develop the skills you need for success! Our inspirational learning programmes help organisations and individuals develop the skills they need for a successful future. Our inspirational programmes promote excellence in a wide range of business and transferable skills - from leadership, management and customer service to warehousing and logistics. A flexible and cost-effective way for organisations and individuals to develop the skills they need. Helping unemployed learners improve their confidence, develop new skills and secure job outcomes. "The BTECs are the highlight of the programme as we are the first direct bank to offer these qualifications to its staff. 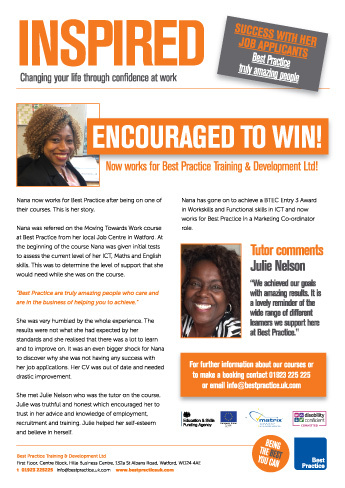 "Best Practice has and is still delivering the service and care that we here at ING Direct value, which has made Best Practice a fantastic choice for our NVQ/BTEC provider." "Please accept our huge thanks for delivering such a professional and seamless service in Communication Skills for our Service Controllers. Your trainer dealt brilliantly with the diverse roles and experience levels of all our participants." "An invaluable NVQ programme for our Emergency Medical Dispatchers and Call Handlers. The time spent on the courses has provided new skills and renewed confidence among my team. I look forward to enlisting your services for the next stages." "I’m absolutely delighted with the results of the training programmes and thanks to the efforts from all involved, we have exceeded our set objectives. This year’s customer satisfaction results have also increased and now sit at 92% of customers feeling satisfied or extremely satisfied." "Best Practice assessors have worked closely with our staff, providing excellent help and support in a professional and compassionate manner. I would recommend Best Practice to any employer considering using external learning." "We have been working with Best Practice to rollout nationally recognised NVQ Qualifications to our National Service Centre. 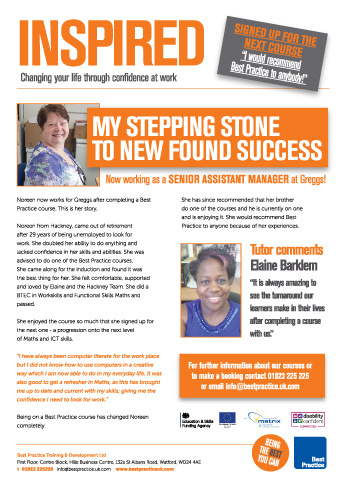 The feedback and support available from your office, assessors and the information on the website was invaluable. The communication and planning has also been excellent throughout." "We have used Best Practice for our latest NVQ Level 2 Qualification in Contact Centre Operations. The sense of achievement, has without doubt had a positive effect on our staff, along with our internal development programmes; the standard of service being offered to our customers has been significantly increased." "Our reputation is paramount to the success of our business; Best Practice not only understands this but works with us to continually raise the bar, exceeding our expectations at every stage. We enjoy working with Best Practice and look forward to the continued development of our business and staff through working with them."